You would think that potting up some recently purchased succulents would be super easy and it basically is. But, if you want to make certain that you are starting off the most successful way then read below for easy but foolproof tips. The first thing you want to do is get all your supplies together. Collect your container that you are going to use. It's doesn't have to be deep because a succulent has a short root system. So, this is a great place to use a garden bowl or even bonsai planter. 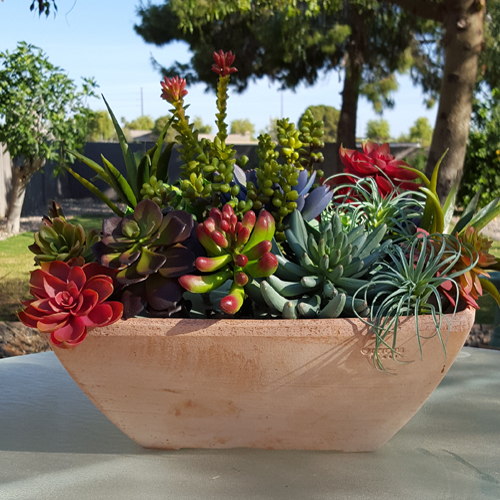 The more succulents you plant on planting the wider the garden bowl should be. Make sure they aren't going to be cramped together. 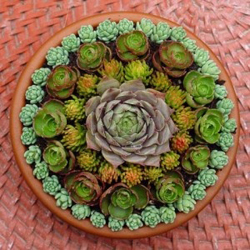 Then select the succulents, get succulent potting soil and some pot filler & pot topper. Now is the time to place a small piece of pot filler in the bottom of the garden bowl. This will keep the soil from coming out of the drain hole but let's the water drain thru. Then fill the pot almost to the top with succulent soil, but leave room at the top for roots and to add more soil once you place your succulent. 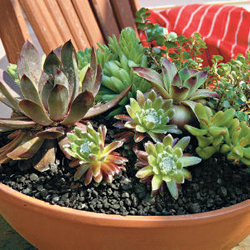 Remove your succulent carefully from the nursery pot being careful not to damage the roots. Place it in the pot and tuck the roots into the soil slightly. Now is time to top off the pot and make sure the plant is covered with soil but no leaves are buried. Press down slightly to make sure it stays in place. Once done planting all the succulents, then top dress the pot. This not only gives the pot a decorative and finished look but it helps protect the roots from wind and sun. Use a bright colored rock or something clever like aquarium rocks. Now is where you really have fun. Leave for a couple of days before watering to let the roots rest before they start soaking up water. Easy Peasy and So much Fun!